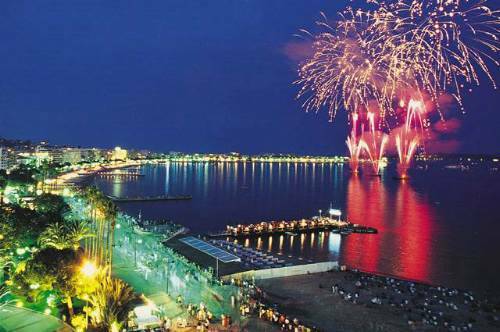 In just over one month the world famous Cannes Film Festival will be upon us and everyone who's anyone in the film industry will flock to this once small fishing port. 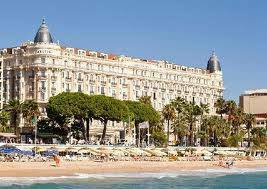 For over 150 years Cannes has been the epitome of glamour, a hub of luxury THE place to be seen. I think that a life in Cannes would rather suit me. The town is full of designer boutiques, there are fine restaurants where seafood is a speciality and well maintained ladies of a certain age drink expressos and smoke cigarettes from behind enormous dark glasses in one of the many cafes. The seafront promenade or La Croissette is the place to take a stroll in all seasons preferably with a small dog, in the summer months there's a chance that you may trip over a celebrity's abandoned flip-flop but, for the unmissable ambiance, this is a risk worth taking. Located on La Croissette there are several beautiful hotels, however, one for me is iconic as it appears to seamlessly link modern day showbiz with bygone Hollywood glamour. The Carlton Hotel is now part of the Intercontinental chain but has been located in the same spot for over 100 years. During the film festival this is the hottest address in town, a favourite with Elton John who used it as the backdrop for the single "I'm Still Standing". In the 1950s Cary Grant and Grace Kelly filmed "To Catch a Thief" here and it was at The Carlton that the latter met Prince Rainier of Monaco who , as we know, went on to become her husband. The hotel has extensive facilities including 343 bedrooms and suites, an on-site fitness centre, private beach, two restaurants, cocktail lounge and fully equipped business centre. Located a short walk away is the art deco Martinez Hotel, another Hollywood haunt. Inside is a restaurant as "A " List as the stars who dine here, La Palm d'Or. The restaurant was opened in 1985 by Christian Willer and has been the proud owner of two Michelin stars for twenty two years. Since 2007 the head chef has been Christian Sinicropi who works where possible with local and seasonal produce to create his culinary masterpieces. The iced Souffle with fresh fruit has to be one of the best puddings that I've ever experienced, and trust me, I rarely skip a pudding. Booking is essential, especially in high season.